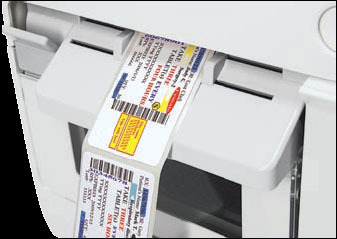 With the increased importance of color-enhanced labels and wristbands, hospitals need a reliable, quick way to produce them that is cost-effective and easy to use. To meet this need, Epson, a leading provider of color printers worldwide, has developed SecurColor™, a color-on-demand inkjet printer for the healthcare market. Current label and wristband printing solutions all have inherent disadvantages and are costly and susceptible to human error. With pre-printed labels, only one color can be loaded into a printer at a time. This means constant roll changes or multiple printers. Either way, the risk of a wrong color being used is significant. Blank label sheets used in desktop color inkjet and laser printers are slow, cumbersome, prone to jamming and the number of wasted labels is high. With Epson's innovative color-on-demand SecurColor inkjet printer you can print custom color-enhanced labels and wristbands with just a single printer when you need them. System software can designate the right color code, reducing risk of human error, reducing wasted labels and lowering expensive pre-printed label inventories.